..."Eli, Eli, why have you foresaken me"...? Ps. 22:1 Eli, Eli, (saying, "Elijah, Elijah, lama sabachthani": [Matt. 27:46]), why hast thou forsaken me (Why has your spirit deserter me), why art thou so far from helping me, and from the words of my roaring? Matthew 27:46 And about the ninth hour Jesus cried with a loud voice, saying, Eli , Eli , lama sabachthani? that is to say, My God, my God, why hast thou forsaken me? 47Some of them that stood there, when they heard that, said, This man calleth for Elijah. NOTE: "Eli, Eli, lama sabachthani" is not Greek, and its meaning is in question or at the crux of the argument. The Aramaic is the problem. The Aramaic word has two different meanings. The translations of the text from Aramaic to Greek in the Scriptures has its problems like any other language. Some believed he was calling for Elij(Y)ah because the Aramaic word for God is similar. The official recognition of the fifth cup of wine as Elijah's own personal chalice is rather of late tradition. Nevertheless, this fifth cup has long been set out on the Seder table. 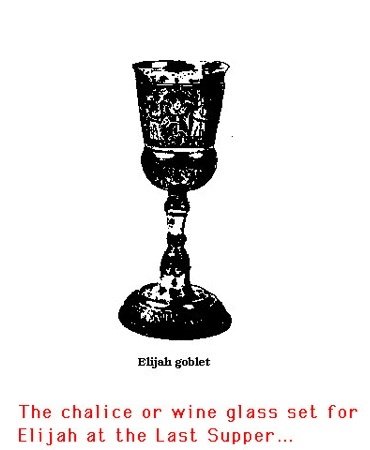 Though it had not been called Elijah's Cup per se, it symbolized the issue which the Jews could not resolve until Elijah would return and explain. The fifth cup on every table came to symbolize the decision of the best Jewish thinkers to set aside this matter and many other theological issues which they had debated for centuries. Certain questions, it had been decided, would await the authority of Elijah who was to return as had been promised. The agruments about the fifth cup, itself, concerned the all so important holy day of Passover. The scriptures are clear that four cups are set out, and the rituals concerning them had always been understood. However, the implied idea that a fifth cup should be used had at least, by the first century of this present era, to include 32AD, taken hold. We know this because the Talmud, written @ 250AD, mentions the debate. 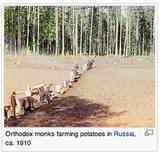 The foundation for the Talmud was the writings and teaching of the Mishnaic Period ,( i.e., the 2nd century BC). This Mishnaic Period was the basis for the corpus of the Mishnah (a third-century AD Hebrew compilation of traditions). So clearly, the rabbi who wrote of the arguments in the Talmud were referring, at least, to a 2nd century BC practice at the Seders, to include that special one, the Last Supper of our Lord. Matt 27:47 Some of them that stood there, when they heard that, said, "This man calleth for Elijah." The scriptures tell us that Jesus drank from the cup that was passed around the Passover table, and his blessing became what Christians call the Eucharist. And, that evening, from the cross Jesus, cried out to Elijah according to the witnesses at the Cross. Just a few evening before that event, Elijah is seen by two apostles leaving Jesus and joining back to Moses. This is a ritual of metamorphosis, (according to the definition of the Greek word the English Bible calls a "transfiguration"). The Christ is gone, returned to Moses who he was very much akin as a miracle worker, [Deuteronony 18:15-20]. And Jesus returns, the son-of-man, is back in the flesh, ready to die on the Cross. Coming down from the mountain Jesus tells his apostles that Elijah had come, was mistreated and ignored. bJesus means that Elijah had just left to return to Moses. But the apostles who did NOT see the transfigurating metamorphosis of the evening just past do not understand. They assume he refers to John who had been beheaded.